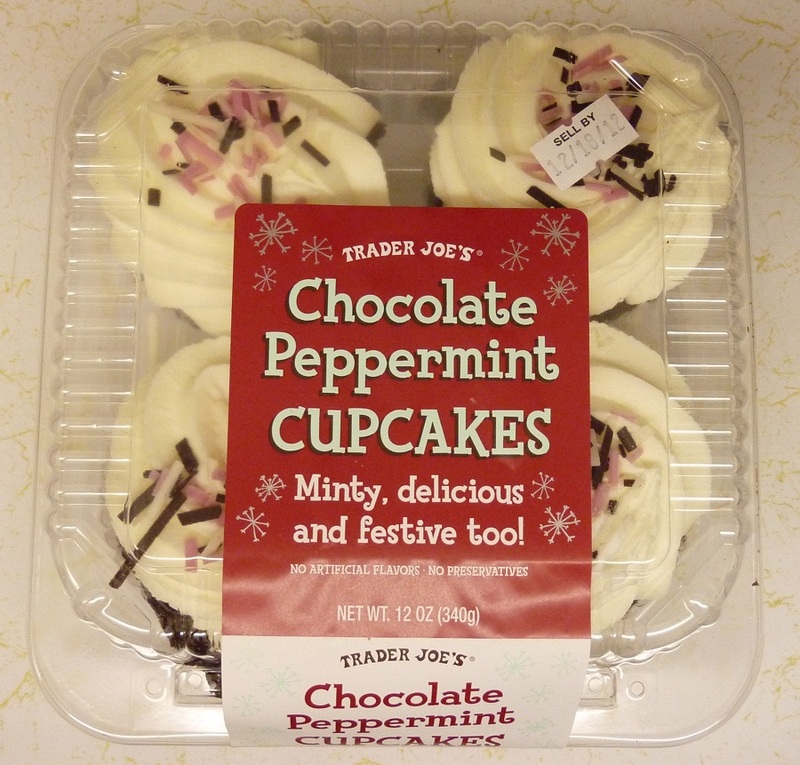 The packaging declares these cupcakes "Minty, delicious, and festive too!" Well, they're certainly minty and festive. On that other point, however, I might not agree so enthusiastically. 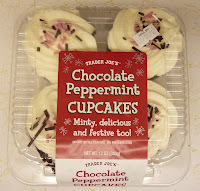 It seems peppermint desserts like Pretzel Slims and Chocolate Covered Joe-Joe's can be hit or miss at TJ's. And new things like Peppermint Macarons are apparently fairly tasty. But, personally, I would call these cupcakes another miss. Don't get me wrong, they didn't taste bad. They were moist, they had plenty of frosting, and as far as I can tell, they were made with quality ingredients. The icing tasted sweet, minty, and cream cheesy. But unlike other sweet frostings, I felt that the flavor conflicted with and overshadowed the chocolate cake part of the product. Chocolate and mint can easily complement one another. Just look at York Peppermint Patties or Andes candies. I'm not sure what exactly is working in those products that failed in this one, but I definitely tasted more peppermint cream cheese than chocolate cake. It didn't taste like toothpaste, which is a plus. But it also didn't taste like a dessert to me. Even the cream cheese, sugar, and peppermint elements of the icing seemed to cancel each other out a bit, even before the chocolate came into play. Again, I could be wrong. There's a lot of positive buzz out there about these cupcakes. But I have to offer this dissenting opinion. There's nothing gross about them, but there's not really anything I would describe as "delicious" either. Sonia enjoyed them significantly more than I did, but she also admitted that she didn't see herself buying these again in the future. There are just too many other products at TJ's that we do find "delicious," and I don't want to waste my precious RDA for calories and fat on something I would say "meh" to. I'll give these a very neutral 2.5 stars. Sonia gives them 3 stars. Ever try there carrot cake muffins? I know what u mean about the cream cheese icing... I've learned u have to be cautious when it comes to TJ's desserts.I think they emphasize the less sugar and overkill w/the substitutes... substitutes aren't all that great for ya any how...butter is a lot better than margarine.. at least butter bakes up better and not full of crap that margarine is. Well, here is an instance where our opinions diverge drastically... i LoVe these cupcakes! 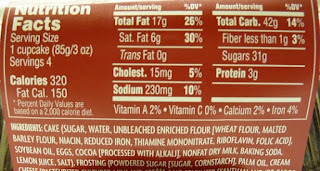 KBF, agreed about sugar substitutes and butter!..no, I have never tried the carrot cake muffins.